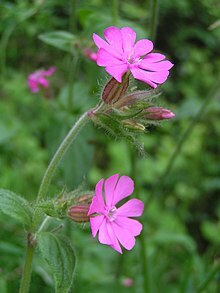 Caryophyllaceae, commonly cried the pink faimily or carnation faimily, is a faimily o flouerin plants. It is includit in the dicotyledon order Caryophyllales in the APG III seestem, alangside 33 ither faimilies, includin Amaranthaceae, Cactaceae, an Polygonaceae. It is a lairge faimily, wi 81 genera an aboot 2,625 kent species. This page wis last eeditit on 20 Mairch 2017, at 03:09.